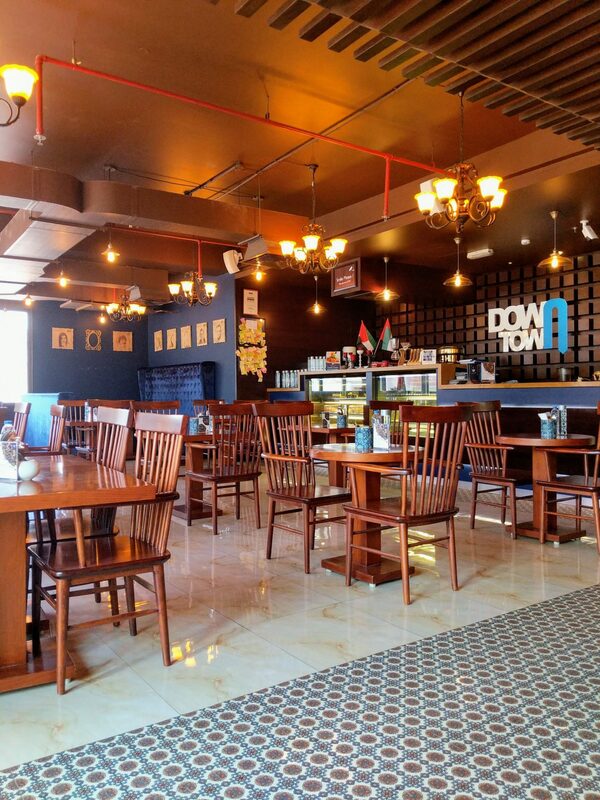 Over the weekend, we went to Downtown Cafe for an early lunch and were glad to find the place wasn’t busy. This is a very welcoming place and the interiors give it a very quirky and warm vibe. 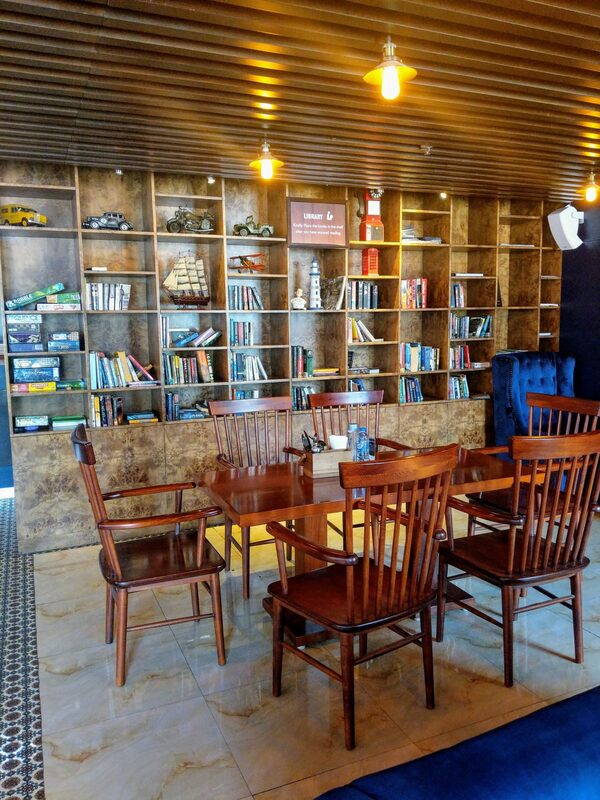 They have a bookshelf with a good selection of books and board games, making it a great place to hangout with family or friends or even spend some quiet time by yourself, if you enjoy reading. The staff were friendly and polite and interacted a lot with the little one. Our server helped us with our order and recommended a few dishes to us. 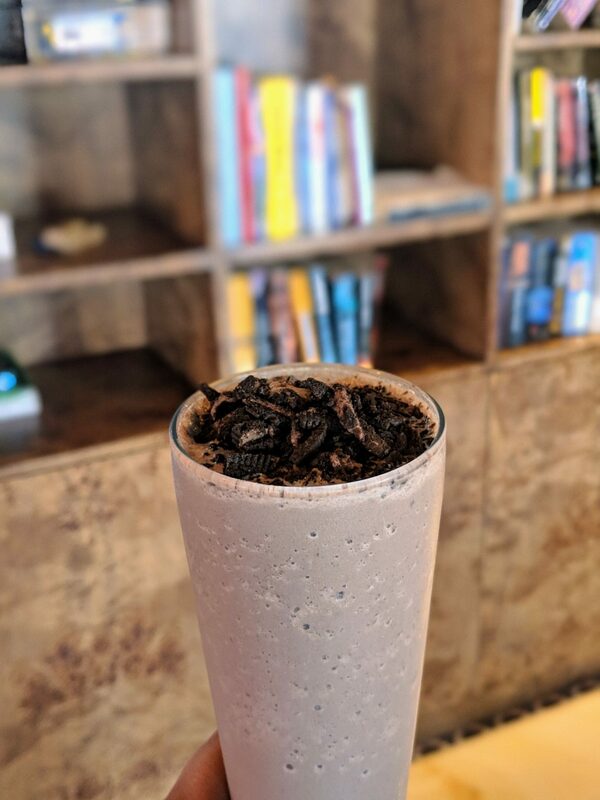 Real American Shake – This was the name of the shake and it was probably one of the best chocolate shakes I have had. 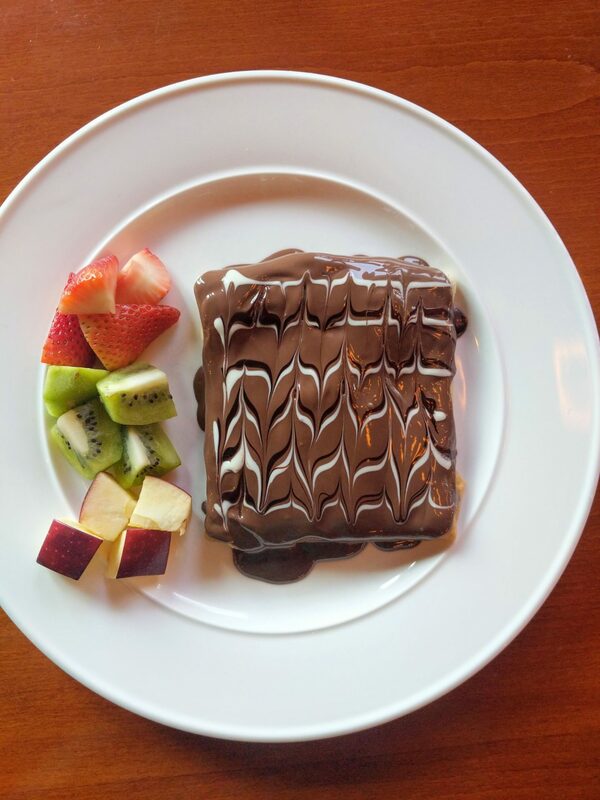 The perfect balance of chocolate and sweetness. It was quite heavy but was absolutely delicious and a must order if you are a chocolate lover! 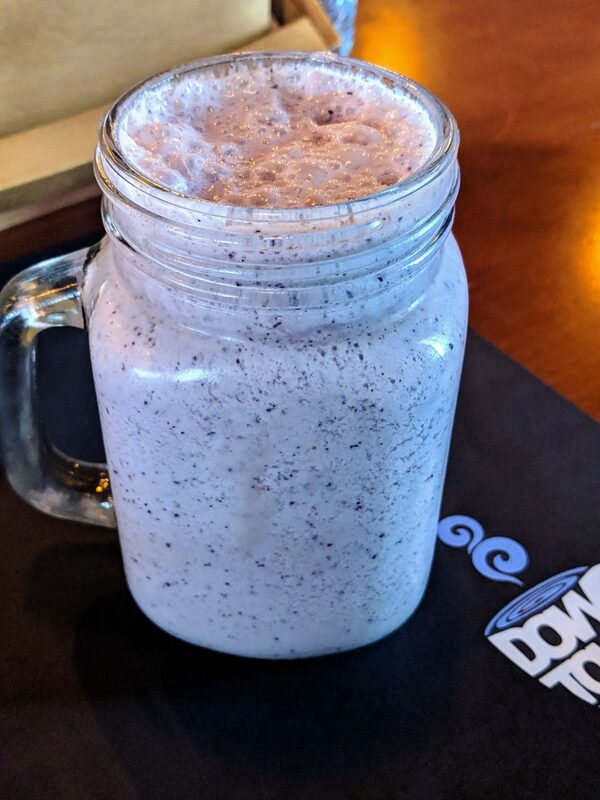 Hurry Berry – This Berry smoothie / shake was really nice. You could taste the berries in this and it wasn’t very sweet, so was perfect. 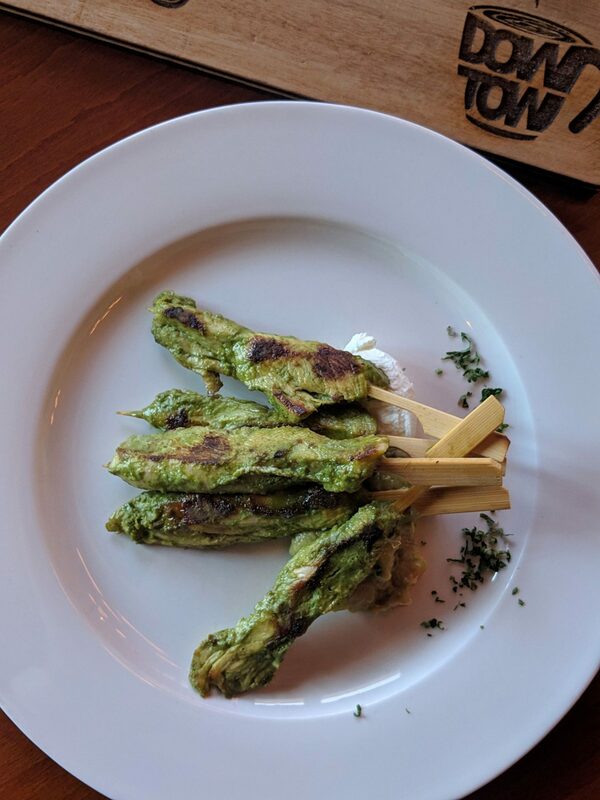 Cilantro chicken satay – This was from their specialties menu. These lightly spiced coriander chicken skewers were delicious. They were well marinated and cooked perfectly. The Labneh and Avocado salsa served with the skewers went well with the chicken. 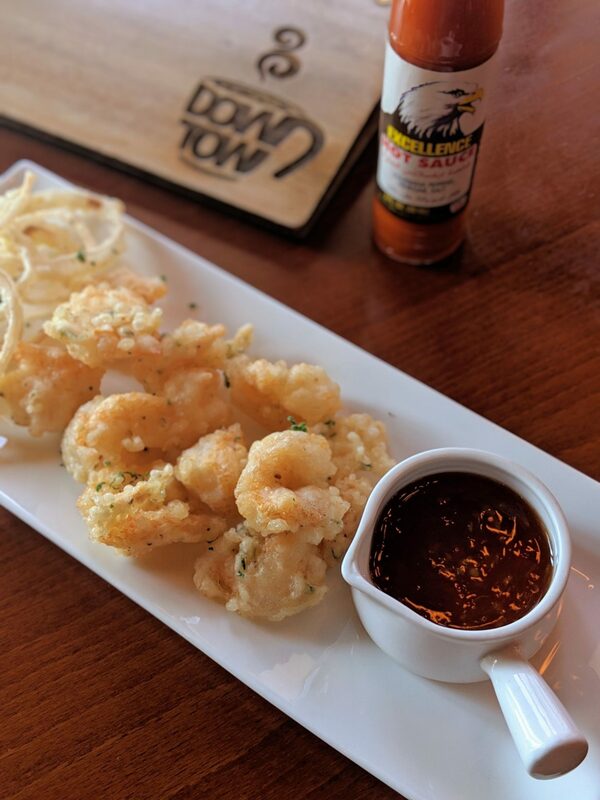 Orly prawn – Crispy fried prawns served with sweet chilli sauce. These prawns were fantastic – crunchy, light and airy. We loved them. 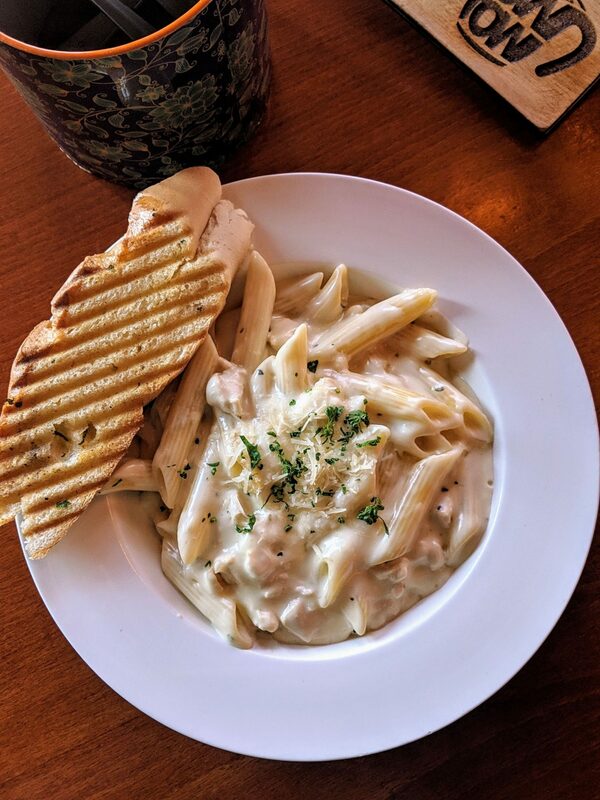 Penne Ducale – This chicken pasta in white sauce was creamy and quite good. We had ordered this for the little one and she seemed to have liked it. 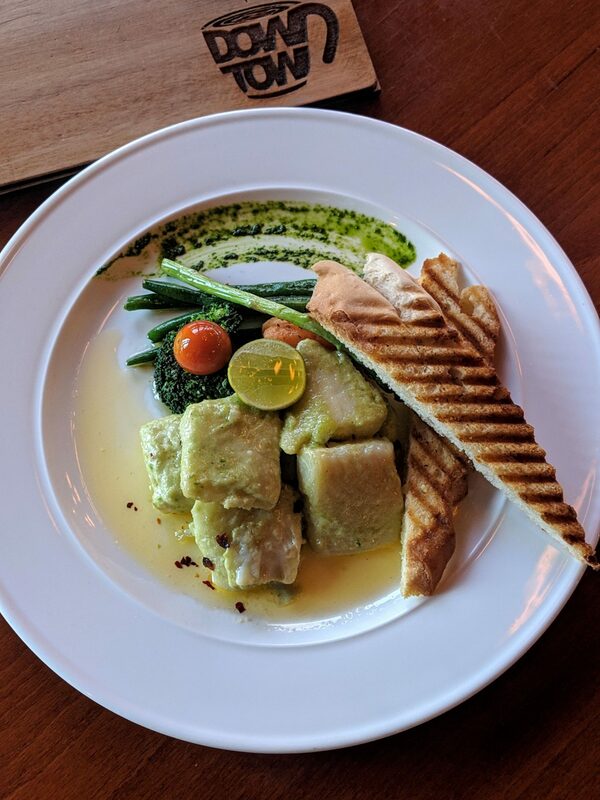 Coco Basa – Basa fish cooked in coconut served with steamed veg and bread. This was our favourite dish here. The fish was perfectly cooked – flavourful, moist and melt in the mouth. I would definitely recommend this dish. 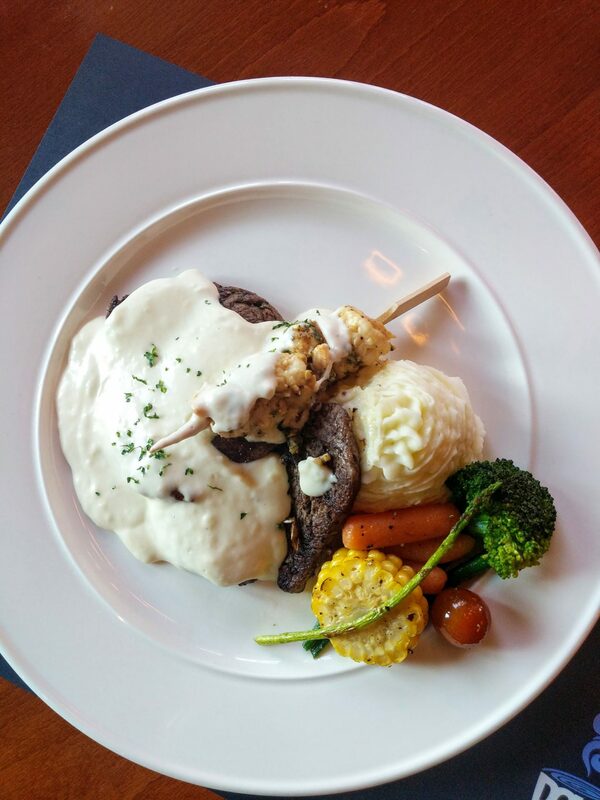 Steak surf and turf – the steak was perfectly cooked and went well with the mushroom sauce. The prawns were tasty too and so was the mashed potato. However, there was a bit too much sauce on the plate but overall, it was very good! 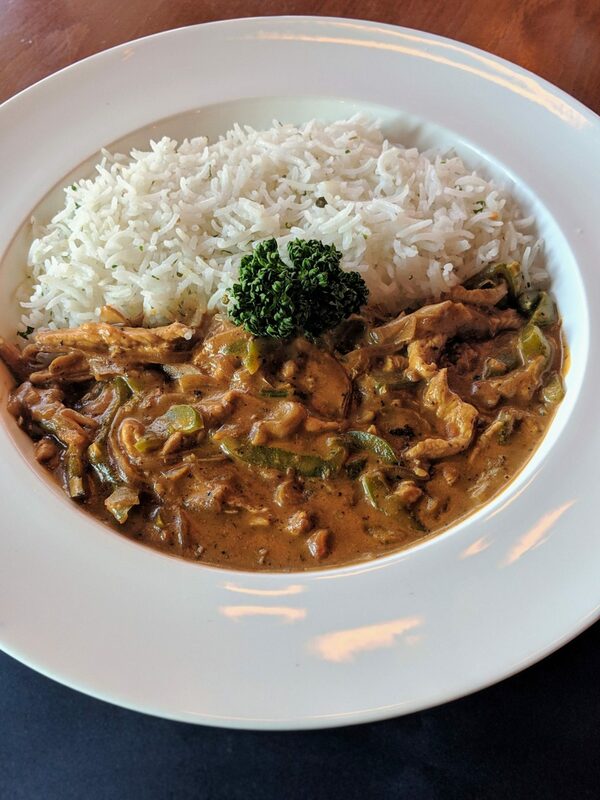 Chicken Stroganoff – Compared to the other dishes we had, this was not very exciting. It was okay. DESSERTS – They have a nice selection of cakes and desserts. Our server recommended the desserts keeping the little one in mind. Brownie crepe – A crepe with chocolate brownie folded inside and topped with lots of chocolate sauce – what’s not to like 😉 This was absolutely delicious and the little one loved it too. 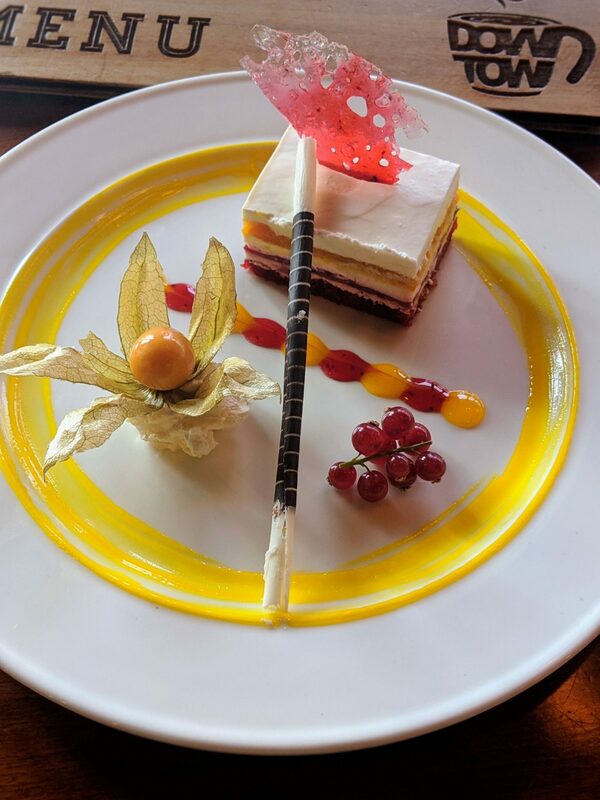 Berry Cheesecake – I can’t remember the name of this cheesecake but this triple layered cake was beautifully presented and tasted just as good. It had layers of red velvet, mango and raspberry and they complimented each other perfectly. We had a nice relaxing meal here – nice ambiance, good food and good service.